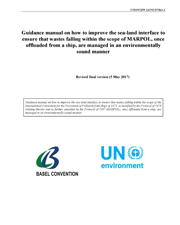 The guidance manual on how to improve the sea-land interface was developed by the Secretariat in response to a request from the Conference of the Parties set out in decision BC-12/16, taking into account the revised version of the IMO Comprehensive Manual on Port Reception Facilities, comments received from Parties and others as well as the Open-ended Working Group, at its tenth meeting. At its thirteenth meeting, the Conference of the Parties adopted the guidance manual and invited Parties and others to use it. . 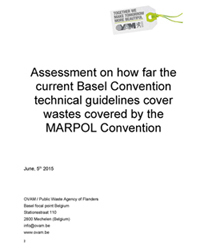 The assessment was developed by the Flemish Waste Agency of Flanders (OVAM), on behalf of Belgium, in response to the invitation of the Conference of the Parties set out in decisions BC-10/16 and BC-11/17. The assessment was developed taking into account comments received by several Parties and the International Maritime Organization. At its twelfth meeting, the Conference of the Parties took note with appreciation of the assessment and encouraged Parties and others to use it.